It is very normal for people to occasionally have a dry mouth, this can be caused by dehydration or anxiety. If you have a persistently dry mouth then it may have an underlying cause which needs further investigation, your dentist may be able to help. What are the causes of a dry mouth. A dry mouth is caused by under active salivary glands which are not producing enough saliva to keep your mouth wet. This could either be because you don’t have enough water in your system and you are dehydrated or due to a medical reason causing the glands not to work as they should. Medication. Some antidepressants and antihistamines can cause your mouth to dry out, if you are taking either of these medications take a quick look at the instructions and see if a side-effect is a dry mouth. Never stop taking prescribed medicines until you have spoken to your doctor about any potential side-effect. A common cold. If you have a cold and your nose is blocked it can cause you to breathe excessively through your mouth, this can dehydrate your mouth, particularly whilst you are asleep. Medical conditions. There are a couple of medical conditions including diabetes and Sjogren’s syndrome which cause dry mouth. Dry lips are very often associated with a dry mouth, as is halitosis. The saliva in your mouth keeps bacteria at bay, without the saliva the bacteria multiply and cause the bad breath. Tooth decay and gum disease are also associated with a dry mouth. If they are not bathed in the saliva then the bacteria which secrete the acid are not neutralised, the acid can then become stronger and cause decay in your teeth faster than normal. Before you know exactly how to treat a dry mouth you need to understand what is causing it. 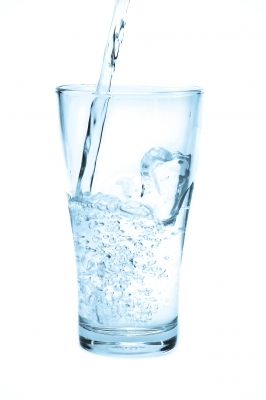 If you believe you are fully hydrated then medical assistance may be required, either from your doctor or dentist. Staying hydrated by drinking as much water as you need per day. Limiting the amount of caffeine you drink as this can dehydrate you. Chewing gum to stimulate the flow of saliva, make sure this gum is sugarfree to avoid tooth decay. Visit a pharmacy and ask for some over-the-counter saliva substitute. Try to breathe through your nose rather than your mouth. Use a room humidifier at night if you think you may be mouth breathing. One of the big problems of a dry mouth is maintaining good oral hygiene to prevent tooth decay. It is extremely important to regularly visit your hygienist and dentist if you have a dry mouth to ensure that your teeth and gums remain healthy. Gum disease can progress painlessly on the whole and only a dental health professional will be able to tell in the early stages if you have either gingivitis or periodontitis. Start brushing your molars and then moved forwards towards the front of your mouth. Brush from your gums towards the chewing surface and use little strokes to get your teeth clean. Make sure to clean all your teeth. Hold your toothbrush up and down to get behind them. Do all of this twice per day and use a fluoride mouthwash in between meals as a top up. Avoid using mouthwash after you brush as toothpaste has a higher percentage of fluoride than mouthwash, if you use a mouthwash immediately after brushing then you reduce the amount of teeth strengthening fluoride around your teeth. 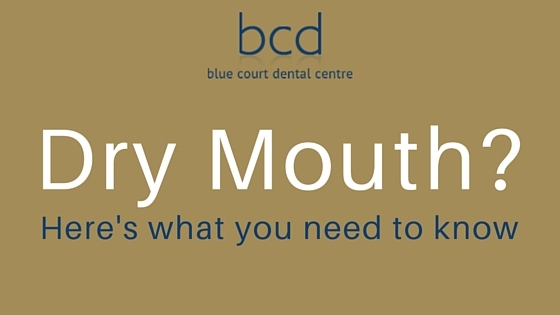 For advice on dental health and dry mouth please give Blue Court Dental a call or request an appointment online. This entry was posted in Dentistry, Did You Know, Oral Hygiene, Share This Post and tagged diabetes, Dry mouth, halitosis, Smoking on 1 August 2016 by Dr Nishan Dixit. How do you know which dental specialist to see? In life we know that if things are particularly complicated then a specialist in that area is the best person to sort it out. Dentistry is no different. Understanding which specialist to see can often be rather confusing so in this blog post, our Harrow dentists takes some time to go through each of the specialist areas to help you understand which person can best solve your dental problems. The following definitions are taken from the General Dental Council specialist register. The development, prevention, and correction of irregularities of the teeth, bite and jaw. Many general dentists are now offering what are known as either short term orthodontics (STO) all limited outcome orthodontics, these treatments move teeth to a more cosmetic situation and include treatments such as Invisalign (clear braces), Six Month Smiles (tooth coloured brackets) and the Inman aligner (rapid orthodontics). These systems typically only move front teeth and don’t address more complicated biting problems. 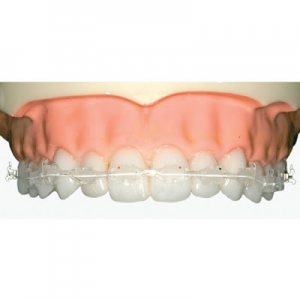 A specialist orthodontist will typically use more complex techniques to move teeth greater distances. A specialist orthodontist can correct biting problems and even work with a growing jaw during the early teenage years to help move the jaw and bone into a better position. If you have a child whose teeth don’t seem to be biting correctly then a specialist orthodontist may be the person to see, many children begin their orthodontic treatment at the age of 12, but it’s worth seeing an orthodontist sooner if you suspect they could be a problem. Adults with crooked teeth could start with a general dentist, see if one of the short-term orthodontic techniques could work and have a discussion about whether a specialist orthodontist would be better suited due to biting problems. The diagnosis, treatment and prevention of diseases and disorders (infections and inflammatory) of the gums and other structures around the teeth. Gum disease can often progress painlessly, it can start as red inflammation with bleeding on brushing, this may be a sign of gingivitis. As this gingivitis and inflammation spreads it can move down the tooth towards the root at this point it becomes the more serious periodontitis which can lead to tooth loss. At this point your dentist will probably refer you to a periodontist. The periodontist will then look at the extent of any disease and work with the treatment and help you prevent it happening again. Prosthodontists are also the specialist which place dental implants. Their detailed knowledge of the gums and other structures surrounding the teeth makes them the perfect person to restore your missing teeth with implants. A Prosthodontist will work extremely closely with a dental laboratory. It will be the dental laboratory which manufacture your crowns, bridges or dentures to replace any missing teeth. These restorative options are also offered by your general dental practitioner but in some instances the restoration of the missing teeth becomes extremely complex, perhaps combining crowns, bridges and dentures in complex ways. 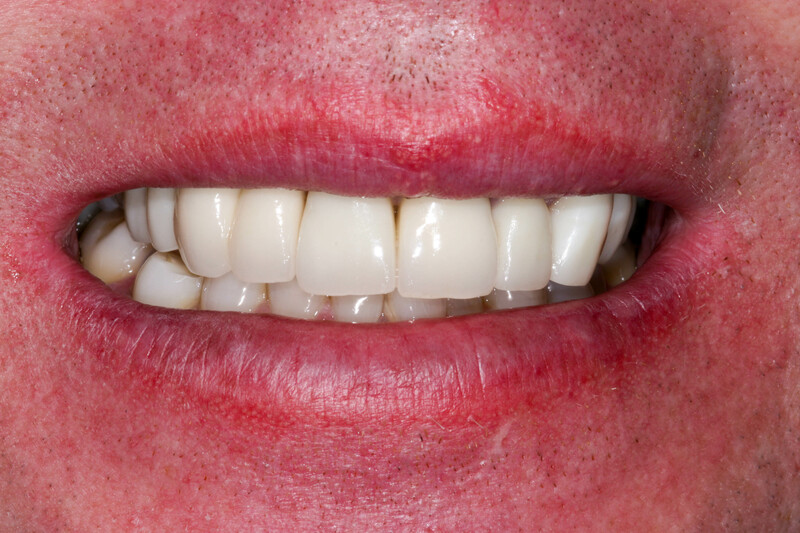 Understanding how these restorations perform together takes specialist knowledge, in this case a Prosthodontist will often help to restore your smile. You may also find that a prosthodontist will work with a periodontist. 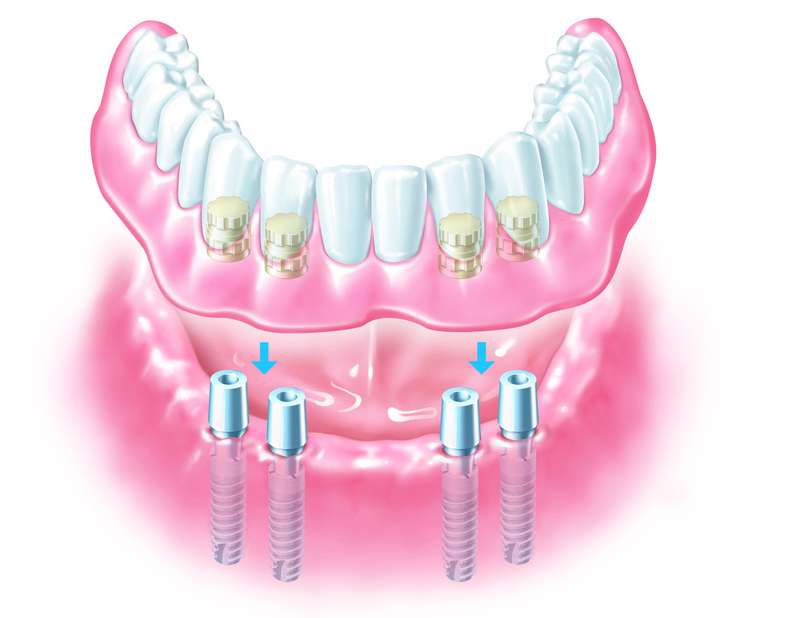 The periodontist may place the dental implants (as in the example above) and the prosthodontist may work closely with the dental laboratory to make the denture on top. It is a close coordination of a specialist team to achieve the best result. The cause, diagnosis, prevention and treatment of diseases and injuries of the tooth root, dental pulp, and surrounding tissue. Endodontics is a specialist field which many general dentists do not offer themselves. It takes many years training to be able to work in the small environment which is the root of a natural tooth. Many people think that root canal treatments are painful, the reality is that this type of treatment actually gets you out of pain. The results can be quite immediate! Working with an endodontist your general dental practitioner is able to save teeth rather than remove them. This is always the preferred option of treatment if at all practical. The treatment and ongoing management of irregularities and pathology of the jaw and mouth that require surgical intervention. This includes the specialty previously called Surgical Dentistry. This is when an oral surgery specialist will step in and support your general dental practitioner in the more complex surgical procedures. A specialist in restorative dentistry works particularly with your natural teeth in order to restore them. This could be the complex combination of crowns, bridges, bonding, looking after the gums or treating complex problems with the teeth themselves. It involves a wide range of skills in order to save teeth. You only ever get one set of adult teeth so it would make sense to restore them whenever possible, rather than have them extracted and be lost for ever. A restorative specialist helps you do this. With so many specialists working to help save, restore and generate your perfect smile it can be a little overwhelming to know where to start. Our dental practice in Harrow works with resident specialists, in all areas, we can refer you to the right person for you, alternatively you could search the specialist register on the GDC website. This entry was posted in Did You Know, Share This Post, Treatment FAQs on 26 May 2016 by Dr Nishan Dixit. Dr Nishan Dixit recently attended The American Academy of Cosmetic Dentistry’s (AACD) annual meeting in Orlando, Florida, USA. The conference, AACD 2014, took place April 30-May 3 and was the Academy’s 30th anniversary scientific session. Dr Nishan Dixit had access to multiple hands-on workshops and lectures during the conference, which was attended by an estimated 1,700 dental professionals. The conference is cosmetic dentistry’s premier event, with some of the world’s most well-known dental educators, live dentistry, access to the latest cosmetic dentistry innovations in the AACD Exhibit Hall, and much more. This entry was posted in Cosmetic, Dentistry in the News, Did You Know, Practice News, Share This Post, Why Choose Us? and tagged British Academy of cosmetic dentistry, cosmetic dentistry, dentist in Harrow, healthcare on 14 May 2014 by Dr Nishan Dixit. In the dental profession we have been warning about the intake of too much sugar for many years, but why is this? It was originally the ancient Greeks that noticed that if they ate too many soft sweet things it destroyed their teeth, at first they thought it was the sugar which was directly responsible for attacking the teeth however we know today that this is not the case. When you eat sugar not only does it act as a food for you, it acts as a food for the streptococcus bacteria in your mouth. As these bacteria feed on the sugar they excrete acids and it is these acids which eat away and attack the enamel outer layer of your teeth. These bacteria can be found in the plaque which often collects in between teeth or around the tooth/gum margin, this is why it is important to keep your teeth cleaned daily, flossing and rinsing to ensure that the plaque does not build up and give somewhere for the bacteria to hide. So, back to our original question.. The Journal of Dental Research carried out a systematic review to inform WHO guidelines on the effects of restricting sugar intakes in various age groups. The research looked at % of sugar in a daily diet and its relationship to the onset of decay. The problem has been that the research has been interpreted misguidedly. Various newspapers have unfortunately taken the step of converting this % of sugar into a spoonful amount, probably to make it easier for the general public to work out how much sugar they should be having. These Papers have converted this into between 5 and 7 teaspoons per day. Unfortunately doing this leads people to assume that they can have 5 or 7 teaspoons per day on their cereal, coffee , tea or anywhere else they add sugar. So it seems that the research is suggesting if we keep our sugar intake below 10% of calorie intake then there is ‘moderate quality’ evidence to show a lower risk of dental decay… So perhaps we should start doing that! 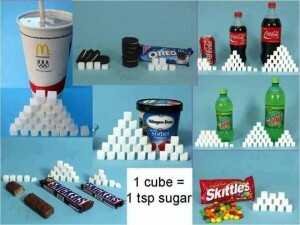 How do we know how much sugar we are eating? We thought we’d give a rough guide to the amount of sugar contained within various food stuffs so that you can be sure to keep your intake ideally less than 10%. Statistics taken from Sugar Stacks – They have included all forms of sugar in these statistics and have simply turned it into a ‘spoonfuls’ amount to make it easier to understand. Research over the years has clearly shown that Eating too much sugar will directly impact oral health, the only question lies around exactly how much is too much. The new research seems to suggest that when we keep sugar intake below 10% (Or around 5 to 7 spoonfuls of all sugar intake per day) there is moderate quality evidence showing a lower risk of dental decay, and that can only be good. Our advice therefore is to look at the quantity of sugar in the food that you eat, remember that sugar can be from many sources and it’s not just the sugar which we add to food that counts. This entry was posted in Dentistry, Dentistry in the News, Did You Know, Oral Hygiene, Questions & Answers, Share This Post and tagged Sugar intake on 21 January 2014 by Dr Nishan Dixit. There are lots of things you can do to maintain your dental health and achieve a fresh and attractive smile. Here are a few top tips to get you going…. 01 Brush your teeth at least twice a day. When you brush, don’t rush. Take enough time to do a thorough job – two minutes is recommended. 02 Use toothpaste that contains flouride to help prevent cavities. 03 Consider using an electric or battery-operated tooth brush, especially if you have arthritis or other problems that make it difficult to brush effectively. 04 Practice good technique. Hold your toothbrush at a slight angle against your teeth and brush with short back-and-forth motions. Remember to brush the inside and chewing surfaces of your teeth, as well as your tongue. Avoid vigorous or harsh scrubbing, which can irritate your gums. 05 Know when to replace your toothbrush. Invest in a new toothbrush or a replacement head for your electric toothbrush every two to three months – or sooner if the bristles become frayed. 06 Cleaning between the teeth at least once a day is important as it removes food and plaque from between the teeth where even the best toothbrush can be ineffective. For most people, doing this once a day is enough and the best time to do it is after your last meal of the day. Clean between your teeth before or after brushing, but rinse your mouth afterward to wash out everything that has been dislodged. 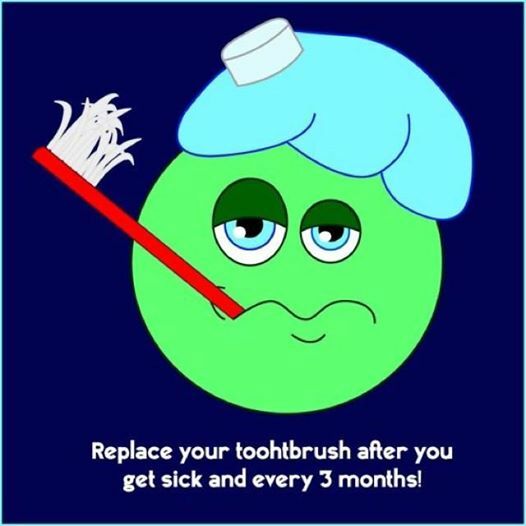 07 Brush your tongue as well as your teeth to help eliminate mouth-borne bacteria and to keep your mouth and breath fresh. 08 A mouthwash can help with oral health. Mouthwashes with alcohol can dry out the mouth, so try to use brands that contain no alcohol. 09 Always wait 20-30 minutes before you brush your teeth after eating or drinking acidic food or drink, such as oranges, as this can erode the enamel on your teeth. 10 Avoid eating too much sugar and drinking sugary drinks such as soda, sweetened teas, or fruit juices, particularly in between meals. 11 Nuts, dairy foods such as cheese, and meats are all good dietry choices that can help strengthen enamel because of the calcium and vitamins they provide. 12 Chewing sugarless gum after a meal is a good way to substitute brushing inbetween meals; it can help remove food particles for between the teeth and produces saliva which counteract the bacteria. 13 Make sure you visit your dentist every six months and a hygienist visit to look after your teeth and gums. 14 If you have a toothache, it is important to seek emergency dental care immediately as this could be a potential infection or abcess. This entry was posted in Dentistry, Did You Know, Oral Hygiene, Share This Post and tagged brushing, check up, chewing gum, flossing, oral health, oral health care, sugar, teeth, tooth decay, toothpaste on 2 July 2013 by Dr Nishan Dixit. We often have people come to our dental practice with sensitive teeth and so we thought we would provide some top tips for people in this situation. 01 Make sure you are cleaning your teeth properly. A simple message but if bacteria and plaque build up on the teeth they produce acids and toxins that attack the teeth and gums. These acids can cause decay and make the teeth uncomfortable, whilst the toxins can cause the gums to shrink away from the teeth making the situation worse. Always remember to clean your teeth. 02 Avoid acidic food and drink. Certain foods contain a great deal of acid, examples are many types of fruit; oranges, lemons, apples etc which contain citric acid. Some fizzy drinks like cola and lemonade, alcoholic drinks like sparkling wines and drinks with mixers are also high in acid. Using a straw to drink through reduces the amount of liquid that goes onto the teeth and helps sensitive teeth. 03 Avoid extremes of hot or cold. Sensitivity of teeth is believed to be due to movement of fluids along tiny tubes on the root surface. Extremes of hot or cold move the fluid in these tubes causing pain. The nerve is not actually exposed, but it can feel very uncomfortable. Luke warm drinks can usually be tolerated well. 04 Use a sensitive formula toothpaste. There are many good toothpastes that can help reduce sensitivity. It is often essential to use them for a few weeks to feel the effect and they work better if some of the toothpaste is rubbed into the area and left to soak in. Some mouthwashes that contain fluoride can also be helpful. Ask your dentist or hygienist for advice. 05 Have a dental examination. Although sensitivity is often caused by the problems mentioned, there may be other reasons for the discomfort. It is always worth seeking professional advice in case there is some decay, a cracked tooth or broken filling. Your dentist will be pleased to discuss your needs and offer you tailored help and advice. This entry was posted in Dentistry, Did You Know, Oral Hygiene, Questions & Answers, Share This Post and tagged brushing, sensitive teeth, sensitivity, sensodyne, teeth on 18 June 2013 by Dr Nishan Dixit. A recent study has shown that people who stay fit and healthy – exercising, keeping to a normal body weight and eating a healthy diet – are 40% less likely to develop gum infections that could lead to tooth loss. This entry was posted in Dentistry in the News, Did You Know, Fun Facts on 25 April 2012 by Dr Nishan Dixit. Many people grind their teeth in their sleep, and are unaware of the problem until either their partner complains of the noise, or they start experiencing dental problems. 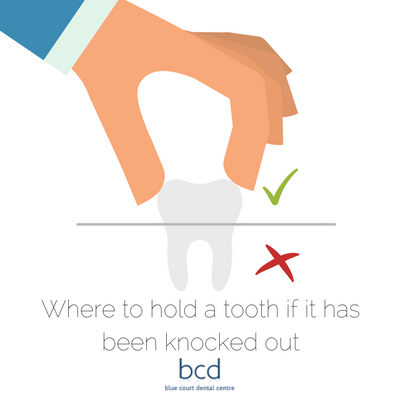 Both grinding and jaw clenching can wear your teeth down, and can also cause teeth to crack or break. They can also put excessive pressure on your jaw joint, which can lead to problems such as chronic headaches or migrains, neck, shoulder and back ache and ear and jaw pain. If you think you might be grinding your teeth or clenching your jaw, do speak to us about it. 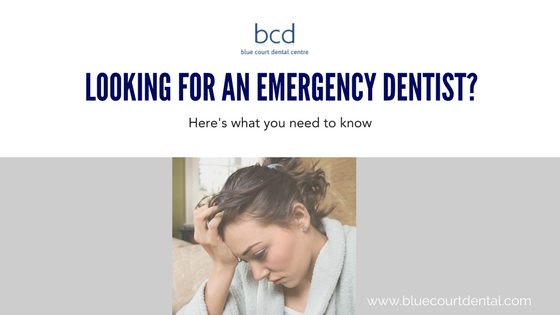 There are a number of things we can do to help, most of which are very affordable and certainly cheaper than having to repair or replace damaged teeth. This entry was posted in Dentistry, Did You Know on 1 November 2011 by Dr Nishan Dixit.